Nevada’s such a dry place that seeing a waterfall can be a novelty. 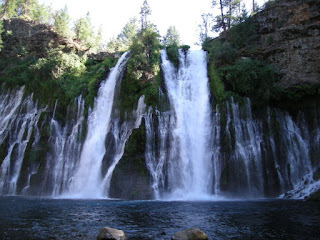 And while Burney Falls is not in Nevada, it’s located close enough to Northern Nevada to make for an interesting day trip. Burney Falls are the centerpiece of the McArthur-Burney Falls Memorial State Park, 40 miles north of the Lassen Volcanic National Park. The 900-acre park (with two miles of frontage along Burney Creek) is located about four hours north of Fallon via U.S. 50 and U.S. 395 to Susanville, then northwest on California State Routes 44 and 89. Located on scenic Burney Creek, which is part of the Pit River water system, Burney Falls deserves being called the “eighth wonder of the world,” a title bestowed on it in the early 20th century by President Theodore Roosevelt. Standing before the falls, you can’t help but be impressed by its beauty and power. Water falls 129 feet into a pool that is 22-feet deep. More than 100 million gallons of water flow over the falls daily. On sunlit mornings, rangers note that you can often see a small rainbow created by the fall’s mists. It is easy to understand why the area’s earliest inhabitants, the Ilmawi tribe, believed the falls to be a sacred place. Native American historians note that the tribe, which considered things of beauty to have great power, used it as a place for meditation and visions. A quarter-mile paved trail takes visitors from a parking area to the foot of the falls. Looking up into the magnificent waterfall, you realize it consists of not just one large flow but of several that pour over the top as well as out of the sides of the cliff. The handful of smaller ribbons of water that seem to come out of the center of cliff are actually the flow of an underground stream exposed by erosion of the basalt rock face. This interesting phenomena means that the falls never stop flowing. During most of the year, the water that flows over the top of the fall is snow melt from nearby mountains. In late summer, however, the creek bed will be bone dry about a half mile upstream but the falls will continue to have water because the stream bed is above this underground acquifer. Like nearby Lassen National Park, Burney Falls State Park contains many volcanic features. The flat landscape of the park is the result of liquid lava-created plateaus. Additionally, the cliffs of the falls are formed of basalt, a volcanic byproduct. In addition to the Native American inhabitants, the area was attractive to early European explorers, who trapped along the creek, then later attempted to farm the area. In the late 19th century, a pioneer settler, Issac Ray, built a lumber mill above the falls but that proved financially unsuccessful. In the early part of this century, a number of hydroelectric dams were built on many branches of the Pit River system, including one that created nearby Lake Britton (the park includes the southern tip of the nine-mile long reservoir). The falls, however, were saved in 1922 when Frank McArthur deeded them and the surrounding 160 acres to the people of California. He was concerned the beautiful falls might be destroyed for a hydroelectric project, as had occurred at nearby Fall River Mills. In addition to the falls, the McArthur-Burney park offers developed campgrounds, fishing, picnic tables, boat launch (on Lake Britton), and five miles of hiking trails. One of the latter takes you to the Pioneer Cemetery where some of the region’s earliest settlers were buried. Additionally, the Pacific Crest Trail, which stretches from Canada to Mexico, passes the west side of the falls before heading to Lake Britton Dam and beyond. There is a day use fee at the park. Campsite reservations are also available by calling 1-800-444-PARK. For more information contact the McArthur-Burney Falls Memorial State Park, 24898 Hwy. 89, Burney, CA 96013, 530-335-2777.